Apparently, this new approach was inspired by a wave of credit card companies raising interest rates, even on Orman’s show’s director’s wife. The nerve! As Teresa Mears at SmartSpending put it "Why do business with companies that treat you badly?" Since when is raising prices treating customers badly? Sometimes prices need to go up because the cost of providing a good or service goes up. Nobody is happy about it. At least the credit card companies (generally) send a polite letter, which is more than I can say about the gas station or the supermarket. And of course, the cost of providing credit card services is going up with the implementation of the credit card act that Congress passed earlier this year. That the fairly obvious consequences of the law are apparently a shock to so many tells us a lot about the level of money common sense in America. As I have mentioned several times here, there are aspects of the argument against credit cards that I just can’t relate to. Plastic vs. cash seems like a no-brainer to me. Plastic is easier, more flexible, and often cheaper. Credit vs. debit also seems easy. Credit is, again, often cheaper, usually gives a short term and interest free loan until the end of the month, and has the option of allowing you to carry a balance at interest into future months. Of course, I acknowledge that what I consider to be an option others consider a curse. Apparently I am part of a small gifted minority of people with the emotional control to charge only what they can pay off at the end of the month. Reading and listening to gurus like Orman and the other sources of mainstream personal finance advice reinforces the idea that people like me are freaks, not to be taken seriously, and certainly not to be considered as a viable model for others. Turns out, we pay-in-full-every-month types are a minority, but hardly a lunatic fringe. According to a useful page of statistics at CreditCards.com, 74.9% of American families had credit cards in 2004, and 42% of those did not carry a balance. Put another way, only 43.4%, less than half, of American families owed money on credit cards. I would be the first to argue that 43.4% is way, way too high. Most of those people are acting foolishly in one way or another. But the flip side is that quite a lot of people, presumptively of normal intelligence and typical levels of emotional stability, seem to be able to resist the sinister temptation to borrow at high rates. Is it possible that the ranks of these non-borrowers could increase? That more people could grow up, get their acts together, and just spend less and pay the bill in full each month? For Orman, and the many like her, the answer to that question is of course not. Her response to higher interest rates is not just to not borrow, but to not use this ubiquitous convenience that will undoubtedly tempt you into borrowing. She takes as an unspoken given that you are incapable of acting like that ultra-capable elite that pay off their cards every month. I am not a devotee of positive thinking, but I think it is within the realm of reasonable that repeatedly telling people they can’t do something may decrease the likelihood that they will try. When Orman et al. are routinely dismissive of the idea that there is any way to use credit cards other than to carry a high interest balance, it reinforces the perception that that is the normal thing to do. Her challenge to attempt to switch to cash only digs the hole deeper. By encouraging her viewers to find out just how tiresome life without plastic would be, she encourages them to quickly return to the "normal" way of life. OMG are you suggesting people pay off their credit cards each month – that’s UNAMERICAN! You know I’m sure my credit cards have gone up, but you know what…I wouldn’t know because they are paid off during the billing cycle. I use them to buy what I need (notice I said need) and then pay them off. I do this for convenience and for rewards. When I need a loan I go to the bank – I’ve done that once – when I bought my house. I got a really good rate and it wasn’t double digits. If I want a short term loan I’d better be prepared to pay for it cause that’s the cost of taking out a short term loan. You may consider yourself “gifted” but the use of credit cards by the gifted and ungifted alike leads to higher retail prices for all of us. Since the “ungifted” form a dominant majority, their credit card abuse also leads to financial problems and government intervention at all levels. So what you consider to be a “no brainer” is actually shallow thinking by someone who cannot escape the Wall Street culture. I just wish someone had taught her parents how to spell Susie. Seriously, how much credibility can someone have when they have MAJOR shifts in strategy three times in 12 months … and all because a for-profit company seeks to make a profit? In Suze’ defense, anyone who would make any real financial decisions based on her advice probably can’t control themselves properly. Tough Guy: Cards only increase the cost of everything for the rest of us if the rest of us use cash. There is clearly a subsidy being paid to those who pay off their bills monthly from those that don’t, but I’m not losing sleep over that. Ugh, I can’t stand her. Good points about cost of business increases, Frank. But, I think the outrage is caused by the perception that credit card companies have been overcharging for their rates for so long, at least compared to what it actually costs them to do business. And yeah, it’s a free economy and everything, but I can understand being annoyed by it. But I agree, Orman is annoying. ToughMoneyLove – if you are talking about merchant fees, then they apply to debit cards as well as credit cards. Since you mentioned before that you use debit cards, then you increase prices as well. Now if you believe that cards create extra demand because of excess buying done by those who overspend, then you may have a point. But the flip side of the coin, is that this extra demand allows some people to keep their jobs. So yes, those who carry balances subsidize those of us who pay in full and also allow some people to earn a living. As Frank said, I am not going to lose sleep over it. That’s interesting…by making only the minimum payments, she was effectively telling you to build your emergency fund up with borrowed money, and pay interest on it all the while. If you have the card anyway, wait until the emergency to carry a balance. I wouldn’t give up the flexibility of credit cards, but I do believe if a person pays in cash they are likely to spend less than whipping out a credit card. 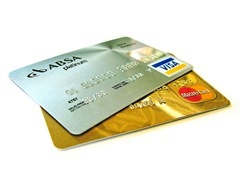 Credit cards offer flexibility, perks and protections if used responsibly and if a person has a decent card. I have several credit union cards that have better rates and conditions than Citi, BOA etc. For the many Americans who have maxed out their credit cards or got stuck with loan shark rates of 29-35%, sticking with cash is definitely a better deal! Why did it take an act of congress to stop the ridiculous loan shark terms of the big banks? GREED!